The BINOM.INV function is categorized under Statistical functionsFunctionsList of the most important Excel functions for financial analysts. This cheat sheet covers 100s of functions that are critical to know as an Excel analyst. It will calculate the inverse Binomial Distribution in Excel. That is, for a given number of independent trials, the function will return the smallest value of x (the number of successes) for a specified Cumulative Binomial Distribution probability. For example, we can use it to calculate the minimum number of tosses of a coin for which there is a 50% chance of at least 10 heads. As a financial analystFinancial Analyst Job DescriptionSee a real Financial Analyst Job Description including all the skills, experience, and education required to be the successful candidate for the job. Perform financial forecasting, reporting, and operational metrics tracking, analyze financial data, create financial models, BINOM.INV is useful in analyzing the best stocks to invest in. We can use the function to understand how a portfolio will be affected by the addition or removal of stocks. 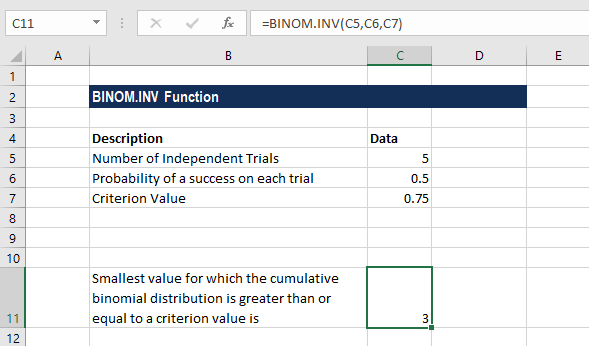 The BINOM.INV function was introduced in MS Excel 2010 and hence is unavailable in earlier versions. Trials (required argument) – It is the number of Bernoulli trials. That is, it is the number of independent trials that are to be done. Excel will truncate the value to an integer if we provide it in decimal. Probability_s (required argument) – It is the probability of success in a single trial. Alpha (required argument) – It is the probability of Cumulative Binomial distribution. It should be between 0 and 1. So, the minimum number of trials is 3, for which the binomial cumulative distribution is 75%. 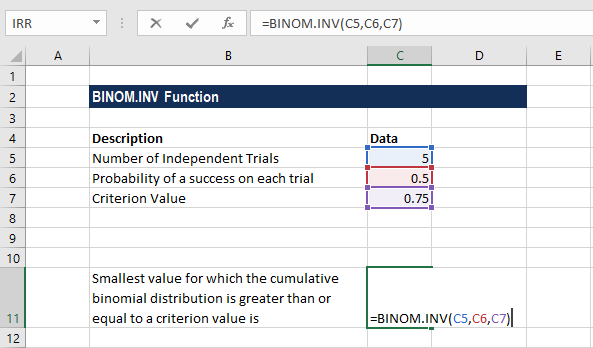 The BINOM.INV function is an updated version of the CRITBINOM function, which is available in older versions of Excel. The given trial argument is less than zero. The probability_s argument provided is less than zero or greater than 1. The given alpha argument is less than zero or greater than 1. If you want to learn more about functions and become an expert on them, check our CFI’s Free Excel Crash Course! Go through our step by step instructions and demonstrations on how to become an Excel power user.